Check out the upcoming events and activities taking place at the Italian Club of Tampa! The events listed below are being hosted by the Italian Club and/or our affiliates. Please click on the flyers to get detailed event information. If you would to purchase tickets to any of our upcoming events, please click the link provided or call the phone number listed on the event. Proceeds from our events benefit the Italian Club Building & Cultural Trust Fund, a registered 501C3 organization (Certificate #:59-2708291) dedicated to the ongoing preservation of our historical facility and the commitment to the Club mission statement. 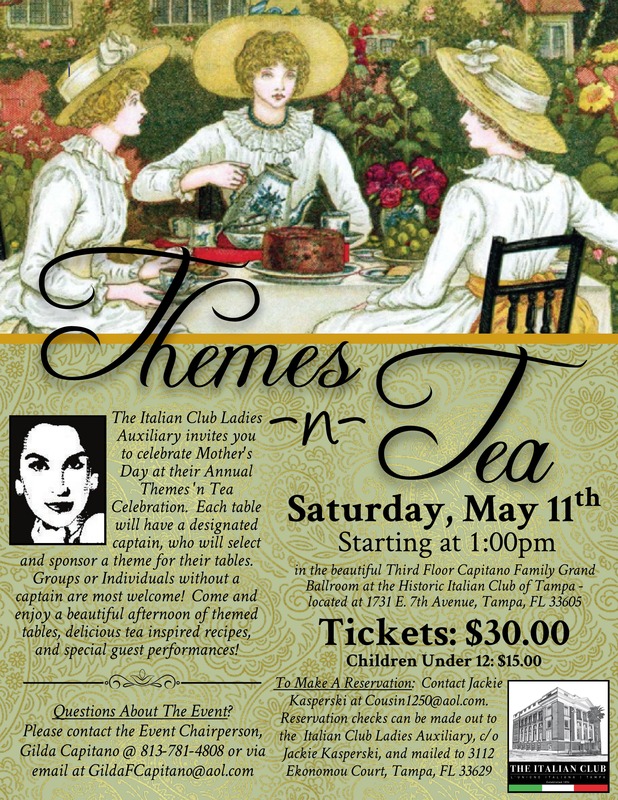 The Italian Club Ladies Auxiliary invites you to celebrate Mother’s Day at their Annual Themes ‘n Tea Celebration. Each table will have a designated captain, who will select and sponsor a theme for their tables. Groups or Individuals without a captain are most welcome! Come and enjoy a beautiful afternoon of themed tables, delicious tea inspired recipes, and special guest performances! Questions About The Event? Please contact the Event Chairperson, Gilda Capitano @ 813-781-4808 or via email at GildaFCapitano@aol.com. To Make A Reservation: Contact Jackie Kasperski at Cousin1250@aol.com. 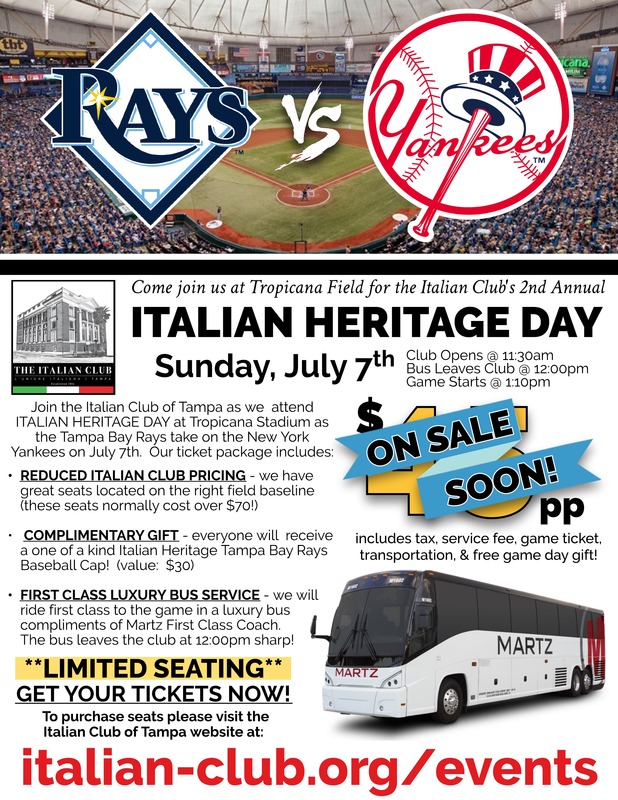 Join the Italian Club of Tampa as we attend ITALIAN HERITAGE DAY at Tropicana Stadium as the Tampa Bay Rays take on the New York Yankees on July 7th. Our ticket package includes: GREAT SEATS at special pricing for attendees, FREE GIFT for all those who join us, COMPLIMENTARY TRANSPORTATION provide by a first class luxury coach bus, and MORE! Details are pending for this special trip! MARK YOUR CALENDARS!